Today we catch up with mezzo-soprano Malgorzata Walewska, who is our opening night Dulcinea in our new production of Don Quixote (opening this Saturday!). 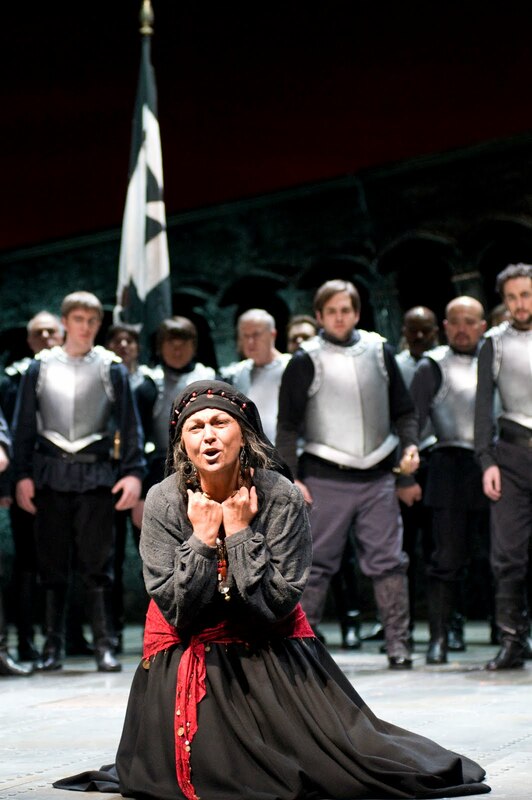 Walewska previously appeared opposite with John Relyea (our opening night Don Quixote; rehearsal photo, left, by Alan Alabastro) in Seattle Opera's 2009 production of Bluebeard's Castle, and we ask her about their collaboration--and what it's like to reject him on stage. What is it like to be working with John Relyea again? This is the second time I meet John on the stage. He is a great and very flexible singer, and a great partner. He is very well prepared—and focused. 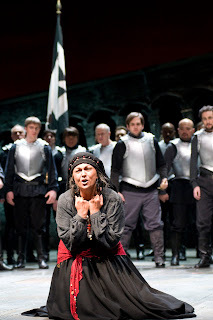 During the Bluebeard’s Castle performances he never stepped on the train of my gown, which was 6 feet long ! I was really impressed! He is also a handsome and tall man, and every woman feels great with a partner like this. I also just noticed that in both Bluebeard’s Castle and Don Quixote, my character is half as young as I am, and John’s character is two times older than he actually is. The power of stage make-up is great. 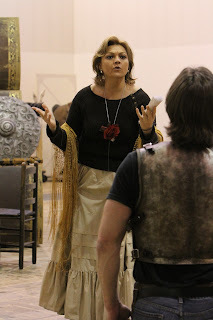 When we saw you in Trovatore, you played a crazy character. Do you think Don Quixote is also crazy? Yes, he is somewhat crazy. This is a man with a child’s soul. He is pure and good, but naïve, and lives in his own fantasy world. But I would not compare him to Azucena’s madness. She freaked out after very traumatic experiences as a young girl. Don Quixote was an educated, adult man. He read a lot of books (maybe too many) and tried to recreate his favorite knights’ lives. Does Dulcinea make the right choice by refusing Don Quixote? What does she think of him? I feel really bad and sorry that I am so cruel to such a gentleman, but...what would I do in the real world? I don’t think I would accept somebody’s proposal only because I feel pity for them. Anyway, Dulcinea notices how Quixote suffers and tries to explain her denial. To me, this is like the situation when a six-year-old pupil falls in love with her/his teacher and insists on marrying him/her. Dulcinea explains how much she likes Don Quixote, but that marriage is impossible. This is always difficult…. A lot of Seattle Opera’s favorite singers are Polish, such as yourself, Aleksandra Kurzak, Ewa Podles, and Mariusz Kwiecien, to name a few. What is the opera scene like in Poland? The National Opera House in Warsaw is my home. I had my debut there in 1991. We have our families and audience in Poland and we perform for them with pleasure, but to evolve we need to practice a lot and experience new things--and there aren’t many theaters in Poland where that is possible. I feel great in Seattle and always come back with great pleasure. I am sure that my Polish singer friends feel the same. By the way I saw Mariusz a month ago and he asked me to send you his best wishes. We all love Speight. He is unique. What are your favorite things to do in Seattle when you’re here? Usually I meet my friends. After my third time in Seattle, I have made many friends. When the weather is good I like to go for a cruise on Puget Sound, or dine in the Space Needle restaurant. If the weather is bad I love shopping. I remember my opera days with my trusty carl zeiss binoculars since I still can't afford a seat near the stage. I still go to performances these days and I love every bit of it.